Downtown businesses are sharing the love with you for February's 2nd Saturday! Stop downtown for deals on all your Valentine's Day Shopping needs and fun date ideas. Join PATABS and The Cake Bar for a great 2nd Saturday event in downtown Hanover PA! Cost is $22 per person and includes supplies for craft and one slice of cake from The Cake Bar. GALENTINE’S DAY — GAL’S NIGHT OUT! RSVP and Collado Cosmetic Lab are teaming up and bringing Downtown Hanover an amazing and fun event! Attendees will be able to taste & buy wine, paint WITH wine and create their own custom shade of lipstick or lipgloss! Must be 21+ to attend. For more information and to reserve your seat, click here. Ornaments are not just for trees you know! Give that someone special a little handmade gift with a beautifully painted or etched ornament that can be filled with a tasty treat like red hots! All materials and instruction will be supplied. This class is for ages 12 and up with a maximum of 20 people. Cost is $15 each. Perfect for kids! Follow along as the artist teaches you how to paint adorable owls! Cost is $25 a canvas ($50 per couple). For RSVP and more information, click here. Bring your sweetie to this special Valentine’s Day Dinner to celebrate your amore! 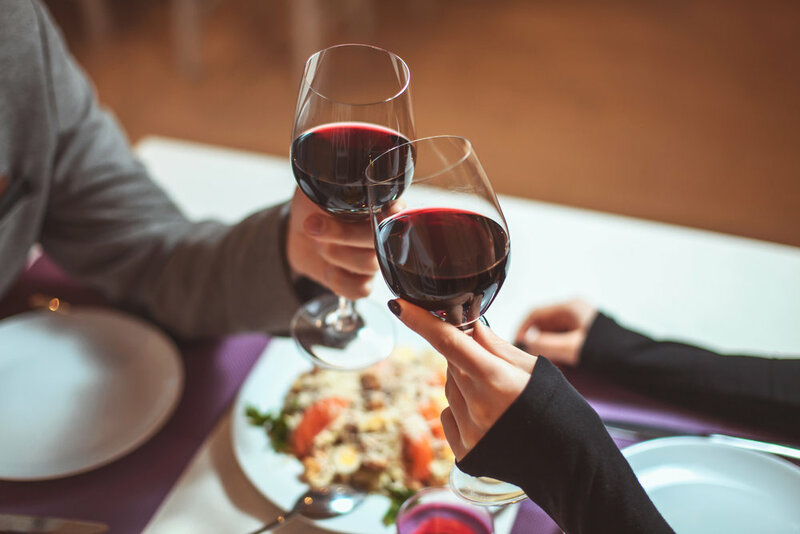 Start things off with a complimentary glass of Prosecco before enjoying a multi-course of traditional, regional Italian cuisine made with local ingredients! To celebrate the month of all things love, the Hotel Hanover has created a "Give Back the Love" Menu for the month of February. A portion of the total proceeds from the "Give Back The Love" menu will be donated to a local charity at the end of the month, so we can all "Give Back the Love" together. Stay local for a very special (and romantic) dinner menu prepared especially for Valentine's Day at Warehouse Gourmet! Sample their special Valentine’s menu, featuring items like Pan-seared Black Sea Bass, 40 Day Dry-Aged Ribeye, and Chocolate Creme Brulee. Entrées on the regular menu will also be available, as well as regular desserts. Shop for your sweetie at the Reader’s Cafe, one of downtown Hanover’s hidden gems. Browse their selection of adult and children’s books, and while you’re at it, sip a coffee or tea. Looking to make it a date? Grab some lunch. Gift cards are available as well. Whether you’re looking for a gift for a coworker, parent, friend, or significant other, Gifty Baskets has it all. They offer food and non-food items for all ages, and they even offer custom gift baskets that you can build yourself. Looking for a unique Valentine's gift? Skip the chocolate and roses--your valentine wants a brewski! Tickets for Snack Town Brewfest are on sale now. Give your valentine the gift of experience; with over forty breweries from near and far, Snack Town Brewfest is a festival sure to please any beer lover! Hosting a Valentine’s Day event or promotion? Submit information to info@discoverhanoverpa.org to be considered for this listing.